The Planning and Development Department contains the offices that deal with any issue related to new building and development questions or applications. The Department offices include: the Town Planner, the Building Official, the Zoning Enforcement Officer, and the Wetlands Agent. The Department works closely with and coordinates with the Chatham Health District, the Town Engineering Consultant, the Water Pollution Control Administrator and the Hebron Fire Marshal. It is in intent of the Department to focus on a long term commitment to economic vitality, environmental integrity, and quality development design through the highest quality master plans, plan implementation, development regulations and development review. The combination of planning and development offices under one Department provides for a coordination of review and approval of building and development projects in Town. Any question relating to planning, zoning, conservation, building, septic, well and sewers can be effectively answered within the Department. The Department coordinates development review with weekly staff meetings with potential developers and builders to provide for a coordinated and efficient review of their proposals. The purpose of this section of the website is to keep Hebron Residents up to date on Planning activities that are happening and on-going in Town. We will endeavor to keep this section current with the most recent and significant planning project that affect the Town. Please contact us if there are questions, or suggestions on any of these projects. The Hebron Planning and Zoning Commission has just completed a two-year process of a comprehensive update of the Hebron Zoning Regulations. This effort was to ensure consistency with the Connecticut General Statutes, remove any internal inconsistencies, help implement the goals and policies of the Plan of Conservation and Development, and to make the Regulations a more user-friendly document. This is the first comprehensive update to the Regulations in over 30 years. The Commission held a Public Information Meeting on October 24, 2017, at the Douglas Library, to provide an overview of the new Regulations, and held a public hearing on March 27, 2018 where the new Regulations were adopted, effective April 9, 2018. To view the new Regulations, click here: Hebron Zoning Regulations – Effective 04-09-18. The Town of Hebron has received a grant through the State’s Local Transportation Capital Improvement Program (LOTCIP) administered by the Capitol Region Council of Governments (CRCOG) and the Connecticut Department of Transportation (CT DOT). The Town made application to CRCOG for the purpose of constructing new sidewalks along Church Street (CT RT 85) as recommended in the Town’s Plan of Conservation and Development. The new sidewalks will extend south along the west side of Church Street from Hebron Center past Hebron Elementary School; and, then south of Kinney Road, the sidewalk will extend further south along the east side of Church Street to the Sunnyside Farms Shopping Plaza. These walks will allow pedestrian access to and from the Town Center, to three places of worship, past several public parks, to Hebron Elementary School, and a neighborhood shopping center. Engineering design plans have been finalized and it is expected that the project will go out to bid and construction would begin in 2019. For over ten years, the Planning and Zoning Commission, the Town of Hebron, private developers, and the local water company worked together to establish public open space around Hebron Center and the Hebron Center Trail. This is a two-mile trail network that passes through Veterans Park on Wall Street, continues through open space north of Hebron Center, passes by mature forests and wetlands, and travels over a pedestrian bridge and emerges back onto Main Street just east of Ted’s Supermarket. From there the trail connects to sidewalks along Main Street and Wall Street which lead back to Veterans Park. A shorter trail loop is also provided by the trail connection that passes by the Hebron Car Wash over to the Liberty Drive sidewalks and back to Main Street. Click here for a trail map of the Hebron Center Trail. Several planning efforts and studies have focused on Hebron Center looking at opportunities to implement the Goals and Policies contained in the Town’s Plan of Conservation and Development and to look more closely at ways to create a more vibrant, economically successful, and pedestrian friendly Town Center. A few of these are as follows. The Town Planner, the Planning and Zoning Commission and the Board of Selectmen all collaborated and developed The Hebron Center Plan. This Plan is a focused look at Hebron Center, bringing together the findings in the Plan of Conservation and Development as well as other studies and projects affecting Hebron Center. The Plan documents past accomplishments and includes planned projects all intended to enhance this area of Town. Read more about this by clicking here. The Hebron Center Plan. The Planning and Zoning Commission, using a grant secured under the Housing for Economic Growth program, has worked with two consultants, Dennis Goderre – a Landscape Architect from Goderre and Associates and Mark Branse, Esq. from Branse, Willis & Knapp, LLC, in looking at a wide range of planning and zoning and economic development issues surrounding Hebron Center and future growth in the Center. The consultants, along with Town staff, drafted new zoning regulations to encourage mixed-use growth and development in Hebron Center as well as other business districts and it is now adopted as part of the Regulations. The goal is to create more economic development opportunities in a way that supports a more vibrant, walkable and mixed-use Main Street. This was one of the strong opinions that came from Hebron residents through the UCONN Charrette process that was conducted in 2011. Another outcome of the Study was to create new design guidelines for the commercial areas and multi-family residential areas in Hebron. These design guidelines were adopted by the Commission. The goal is to provide for new development, but in a way that is consistent with Hebron’s New England small town character. The Planning and Zoning Commission on June 10, 2014 approved the 2014 Town of Hebron’s Plan of Conservation and Development. The previous Plan was last adopted in 2004, and State law requires that this document be updated at least every ten years. Click on the button above to review Hebron’s current Plan of Conservation and Development that provides a overall vision of how the Community should develop over the next 10-year planning period. The Town of Hebron and its Economic Development Commission hired Peter Fairweather, of Fairweather Consulting, to conduct a Market Study of Hebron’s Business District. Over a number of years, the Town of Hebron has made a commitment to reinvest in Hebron Center to create a successful, dynamic, and walkable Town center. This study is another step in that process. The work identified potential commercial uses that could be attracted to, or expanded in, Hebron. The study included an analysis of the existing market potential in Hebron and the surrounding area, and a “benchmark” of Hebron against other downtown centers to better understand the strengths and weaknesses of Hebron Center. The study has identified the types of uses for which Hebron Center has a competitive advantage and includes an action plan to attract those uses to the Center. This study is still being used to guide the activities of various Town boards and commissions in terms of planning and economic development. Click the link for the Hebron Center Market Study to read this important report. The Open Space Land Acquisition Committee and Town staff have been very active in submitting grant applications on behalf of the Town under the State’s Open Space and Watershed Land Acquisition Grant Program, to assist with the acquisition of key open space parcels of land. These applications are guided by the Town’s Plan of Conservation and Development, and the Future Open Space plan included in that document. In January of 2018, the Town received notice of our most recent successful grant application. This grant is in the amount of $102,000 to assist with the purchase of 48 acres of the Calvin Fish property located adjacent to the Gilead Hill School site. The parcel of land extends from Gilead Street down to Fawn Brook and contains a significant stretch of Fawn Brook and the Fawn Brook wetlands. The Fawn Brook Greenway is one of Hebron’s most significant watercourses and is identified in the Town’s Plan of Conservation and Development as a key area for protection and acquisition. The Peters House, at the entrance to Burnt Hill Park, is slowly returning to its early magnificent appearance. All who have passed 150 East Street have noticed the restoration of the exterior of this historic house, including new paint, restored trim, new roof, re-pointed chimneys, and new and restored windows. 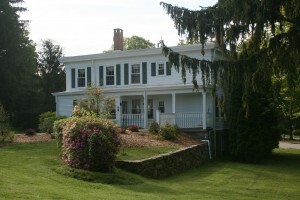 The work to date has been funded from a variety of sources including the Town’s CIP, but mainly though State grants including the State’s STEAP (Small Town Economic Assistance Program) grants, other grants received through the State Historic Preservation Office (SHPO) and the Department of Economic and Community Development (DECD), as well as an award from a private foundation, the 1772 Foundation. More recent work has been happening in the interior of the house with a new heating system installed, new plumbing including a new water supply from the Burnt Hill Park water system, and new electrical service. Volunteers have been hard at work doing necessary demolition inside the house as well as working on restoring several of the rooms including installing a new code-compliant stairway to the second floor. A slow process, but progress continues to be be made. The Town is working with the Historic Properties Commission to sign-up and coordinate the volunteer phase on the interior of the house. There will be tasks appropriate for individuals at all levels of expertise. Volunteers will be offered the chance to spackle, paint, restore flooring, complete wainscot, re-point masonry, and probably work on exterior yard and garden beautification. For more experienced craftspeople, there will be the opportunity to replace boards and molding around fireplaces, and to make other alterations. As work continues, it is our hope that individuals from other professional areas will group together to offer their services to the Historic Peters House. The Historic Properties Commission is currently collecting names of interested volunteers and organizing training sessions. Through several STEAP grant awards, the Town has funded a number of Main Street improvements to increase the attractiveness of Hebron’s main business district, to encourage more visitors and business traffic to the area, and to improve pedestrian access throughout the center. These grants have funded the construction of sidewalks along Main Street, new street trees and other plantings along Main Street, new “Welcome to Hebron” signs at each entrance to the business district, and funded a portion of the cost of facade improvements to a number of local businesses. These businesses include: Gina Marie’s, Ace Hardware, Countryside Realty, Hebron Eye Care, Something Simple Cafe, and the free standing signs at Ted’s plaza. The most recent STEAP grant funded the expanded parking lot behind the Douglas Library as well as the new parking lot on Pendleton Drive which will be shared by Town facilities, by surrounding private businesses, and for public events. Hebron’s successful program is highlighted on the State’s Office of Policy and Management website. Click here to read more. The Town of Hebron along with nine other towns in the Salmon River Watershed have entered into a Partnership with the Nature Conservancy in a multi-year effort to take actions to preserve and protect the water quality of the Salmon River that all these towns share. One of the first products of the Partnership is a “Salmon River Watershed Municipal Land Use Evaluation Project”. This report reviews and makes recommendations on land use regulations and public works maintenance practices of all towns in the Watershed. The Partnership has sponsored training and workshops, as well as water quality monitoring efforts, throughout the Watershed. Click here to see a copy of the 2018 Annual SRW Partnership Newsletter. SRWP 2019 newsletter. For a full copy of the Salmon River Watershed Municipal Land Use Evaluation Project report, please Click Here. You can also contact the Chatham Health District and learn more about their organization at their website at: www.chathamhealth.org. The following pages explain the functions of the various offices within the Department of Planning and Development, contact information, and forms and information that will assist you with your interaction with the Department.